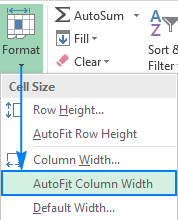 In this short tutorial, you will learn a few efficient ways to change the column width manually and have it adjusted automatically to fit the contents (AutoFit). 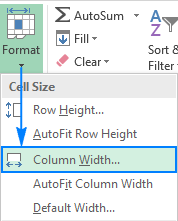 Changing the width of a column in Excel is one of the most common tasks that you perform daily when designing your reports, summary tables or dashboards, and even when using worksheets only to store or calculate data. Microsoft Excel provides a variety of ways to manipulate the column width - you can resize columns using the mouse, set the width to a specific number or have it adjusted automatically to accommodate the data. Further on in this tutorial, you will find the detailed information about all these methods. On an Excel spreadsheet, you can set a column width of 0 to 255, with one unit equal to the width of one character that can be displayed in a cell formatted with the standard font. On a new worksheet, the default width of all columns is 8.43 characters, which corresponds to 64 pixels. If a column's width is set to zero (0), the column is hidden. If you want the information in all cells to be readable, you can either wrap text or adjust column width. To change the width of a single column, drag the right border of the column heading until the column is set to the desired width. To change the width of multiple columns, select the columns of interest and drag the border of any column heading in the selection. To make all columns the same width, select the entire sheet by pressing Ctrl + A or clicking the Select All button , and then drag the border of any column header. Select one or more columns that you wish to resize. To select all columns, press Ctrl + A or click the Select All button. On the Home tab, in the Cells group, click Format > Column Width. In the Column width box, type the desired number, and click OK. Tip. You can get to the same dialog by right-clicking the selected column(s) and choosing Column Width… from the context menu. In your Excel worksheets, you can also auto fit columns so that they get wider or narrower to fit the largest value in the column. To autofit a single column, hover the mouse pointer over the right border of the column header until the double-headed arrow appears, and then double click the border. To autofit multiple columns, select them, and double click any boundary between two column headers in the selection. To force all columns on the sheet to automatically fit their contents, press Ctrl + A or click the Select All button, and then double click a boundary of any column header. 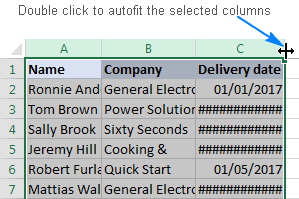 Another way to autofit columns in Excel is by using the ribbon: select one or more columns, go to the Home tab > Cells group, and click Format > AutoFit Column Width. When preparing a worksheet for printing, you may want to fix the column width in inches, centimeters or millimeters. With the width fixed, you can exit the Page Layout view by clicking the Normal button on the View tab, in the Workbook Views group. Tip. In the English localization of Excel, inches is the default ruler unit. To change the measurement unit to centimeters or millimeters, click File > Options > Advanced, scroll down to the Display section, select the desired unit from the Ruler Units drop-down list, and click OK to save the change. 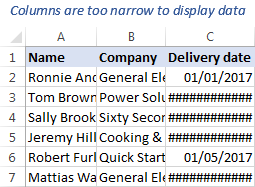 You already know how to make several or all columns on the sheet the same width by dragging the column border. If you have already resized one column the way you want, then you can simply copy that width to other columns. To have it done, please follow the steps outlined below. Copy any cell from the column that has the desired width. For this, right-click the cell and choose Copy in the context menu or select the cell and press Ctrl + C.
Right-click a cell(s) in the target column(s), and then click Paste Special…. 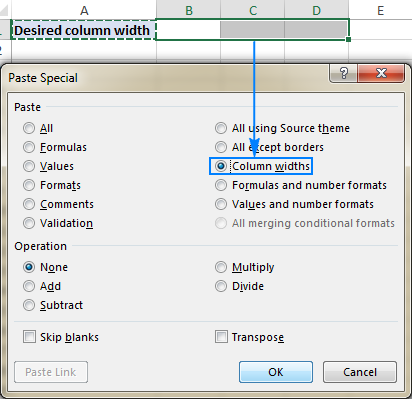 In the Paste Special dialog box, select Column widths, and click OK.
Alternatively, you can select some cells in the target columns, press the Paste Special shortcut Ctrl + Alt + V, and then press W.
The same technique can be used when you create a new sheet and want to make its column widths the same as those in an existing worksheet. To select a single sheet, click its sheet tab. To select several sheets, click on their tabs while holding the Ctrl key. 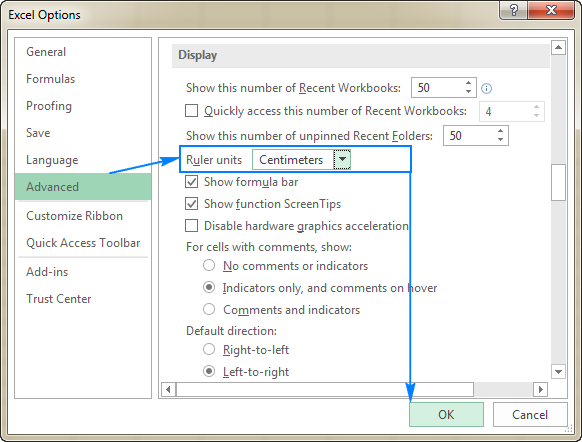 To select all sheets in the workbook, right-click any sheet tab, and choose Select All Sheets from the context menu. On the Home tab, in the Cells group, click Format > Default Width… . In the Standard column width box, input the value you want, and click OK. Tip. 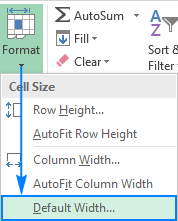 If you would like to change the default column width for all new Excel files that you create, save an empty workbook with your custom column width as an Excel template, and then create new workbooks based on that template. As you see, there exist a handful of different ways to change column width in Excel. Which one to use depends on your preferred work style and situation. I thank you for reading and hope to see you on our blog next week! 7 Responses to "How to change column width and AutoFit columns in Excel"
What will 80 pixels convert to in characters? And how can I calculate this in the future? unfortunately, we can’t tell you exactly how many characters 80 px will take, because it depends on the font family, font size, Excel and Windows versions installed, and your monitor resolution. The simplest way to see how many characters fits into your cell is to right-click and hold between two column headings, and Excel will instantly show you the result. I think Jimmy was looking for a default calculation. The article states, "On a new worksheet, the default width of all columns is 8.43 characters, which corresponds to 64 pixels." It makes sense that the character width to pixel ratio is dependent on the standard font (although I haven't tested to see if changing the standard font affects this ratio). However, I suspect the default ratio of 8.43 characters to 64 pixels is pretty standard. Or perhaps the article should not have stated the default column width and the corresponding pixel count? Jimmy, on my version of Excel, which has the default ratio above, each character past the first one takes up 7 pixels. For some reason, Excel divides the first character into 12 divisions. You can hover over each column divider to see the width in both characters and pixels. Test by changing the column width, then hover the mouse to confirm that ratio is correct on your version also. I want to copy and paste a formatted Excel (weekly) report to MS Outlook. When I do that the table expands as if I did a "auto fit" for the column width. How can I prevent this from happenning. Basically I want the same column widths to be maintained in Outlook as well. I could do this on Gmail, but not in Outlook - App or the Web.